On February 16th at the home of my friend Ginger, a gathering of about 30 women took place. The occasion? The release of my book, but more so to me a fresh release of the Spirit. My hope was that women would not leave with more of “me” but wooed by Christ, the fountain of life. The night was amazing. Sadly, in the excitement of the night a camera was forgotten! Amiee, the one who has written the first review (and only, c’mon my readers!) on Amazon, spoke for ten minutes, referring to the book as a “tool box” and detailed who would best be served with the “tools” within. Being an English teacher, book lover and writer in her own right, she shared her insights on what she termed as “an unusual writing voice in the sense that she (I) write inductively, not deductively, thus the reader is taken in on the author’s personal journey, yet she (I) makes it universal”. I appreciated her insights and observations. Ginger and I then hopped on stools upfront where Ginger proceeded to “interview’ me. Oh how I love a large group of women to speak to, to compel, to invite, to proclaim the goodness of God! I found this electrifying. 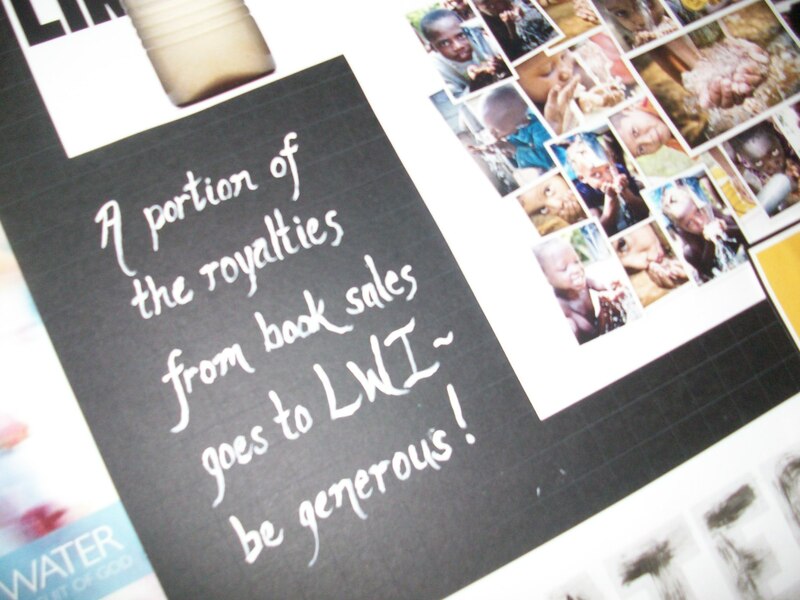 I was also excited to share about my partnership via the book with Living Water International and how one book purchased from me directly provides pure water for one person for just over seven months! After I spoke, Aimee quietly played the keyboard in the background and about 8 women randomly read scriptures from my book about water. Beautiful. Then friends Allison, Jaime and Aimee led a time of worship with songs centering around water, running and Christ. This trio was amazing and generous with their gifts! Here was a gathering of women I mostly did not know, coming together in worship. I found this very moving, something I have prayed to “oversee” most of my life. After the worship quietly died down, I prayed blessing and hope over these dear women. We then sold books and I was able to speak personally with them, staying out late into the night to laugh and pray. The night was truly anointed. Special gratitude to Ginger, Aimee, Allison and Jaime for their care and generosity. 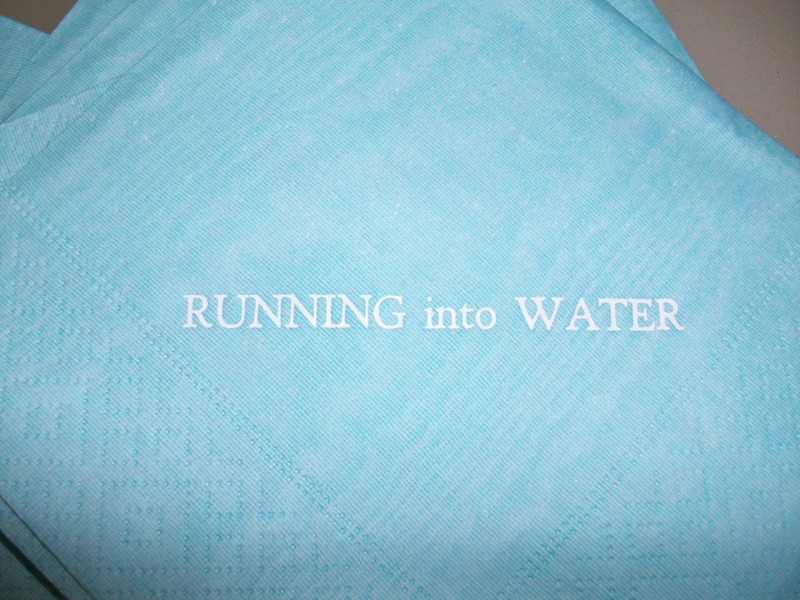 The first imprinted napkins I have ever had! 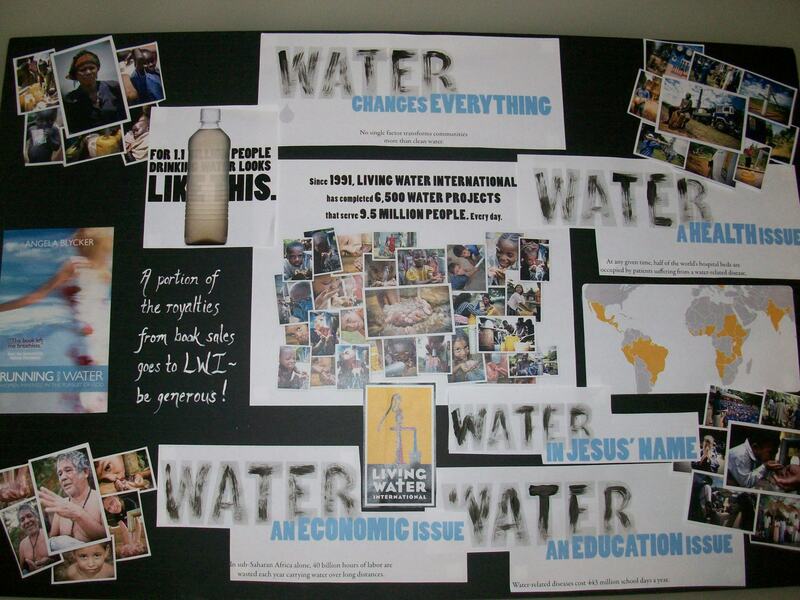 Display I put togther about Living Water Internationl. Previous Post What a Healing. Next Post A Night To Remember.